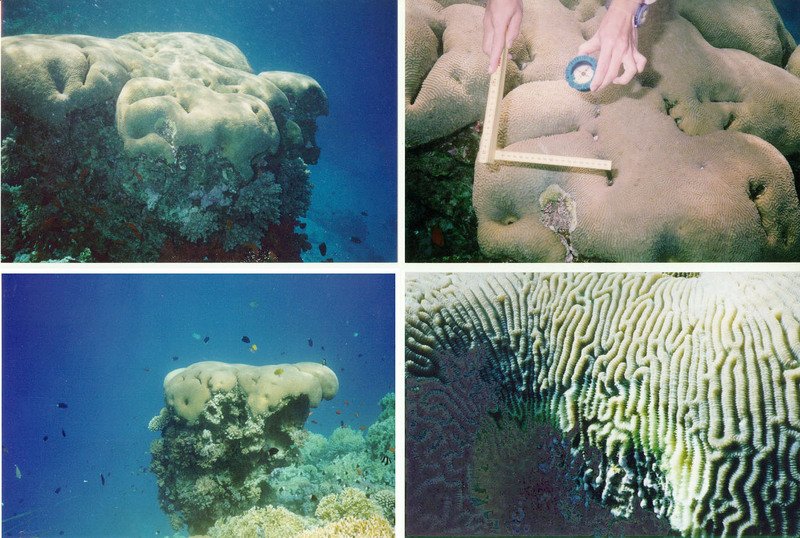 The coral disease survey was attempted for the first time in 1999 as part of the Marine Ecology Field Course by the University of Vienna, Institute of Ecology. The main interest was focused on hard corals (scleractinians) because they comprise most of the framework of a living coral reef, and they are home for a great number of marine organisms. Coral mortality in reefs is a well-known and common event. Even the healthiest reefs always contain some dead colonies among the coral aggregation. Although the aragonitic skeletons of hard corals remain intact long after the coral animal has died, they scarcely reveal the cause of their death. Thus, coral mortality is easy to record but difficult to investigate. Despite this complication, some coral degradation can be easily traced and classified as biological destruction such as predation (e.g. by polychaetes, crustaceans, molluscs, echinoderms, fish, etc.). On the other hand, corals can also die from being overgrown by algae, sponges, zoanthids, octocorals, ascidians or simply due to interspecific competition. Recently, coral mortality seems to reveal yet another set of causes which goes beyond those listed above - symptoms of anthropogenic origin. Coral diseases, first reported in 1973 (Antonius), have not yet received the attention of marine biologists that they would deserve. With the onset of global climate change (a factor that should no longer be neglected), however, their frequencies and extent of damage are on the increase. Recent reports regarding diseased corals from around the world have focused on these dramatic events (Antonius, 1984). In order to avoid its continuos spreading and to attempt the conservation of healthy corals for future generations, coral disease monitoring deserves more attention today than in the past. The goal is to avoid the continuous spread of diseases and to conserve healthy coral reefs for future generations - be it for recreational purposes or for other sustainable uses by mankind, e.g. as an additional source of proteins, as an important pool for the pharmaceutical industry in the extraction of prostaglandins and anticancer agents, etc. (Gosliner et al, 1996). Moreover, coral reefs represent the most diverse marine ecosystems. They provide habitats not only for fish and other marine organisms, but also form entire inhabited islands. Furthermore, coral reefs are essential wave blockers that reduce coastal degradation and erosion. Based on their vulnerability, reefs can be used as indicators of environmental stress, i.e. to monitor chemical pollution, eutrophication, sedimentation, sea temperature and salinity fluctuations, or excessive impact from tourism or from military facilities. 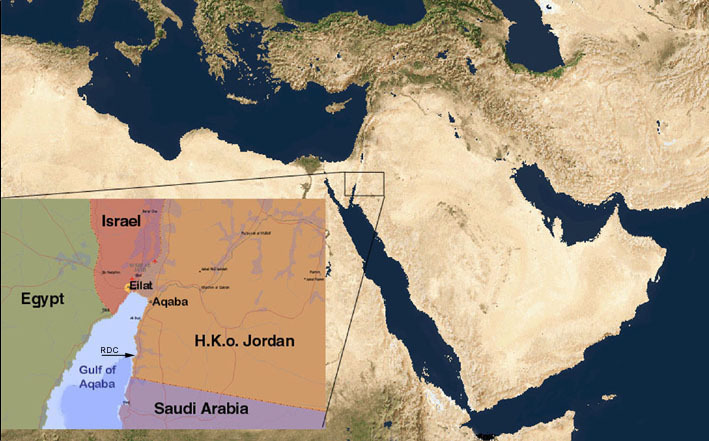 The investigation of coral diseases was done at the narrow fringing reef, often referred to as a contour reef, in front of the Royal Diving Center (RDC), 10 km south of the city of Aqaba and 3 km north of the Saudi Arabian border on the eastern side of the Gulf of Aqaba - Red Sea. The arid climate favors a dusty and rocky terrestrial environment with little plant growth. Air temperatures in the summer can reach extremely high levels, leading to evaporation of the waters in the gulf. This results in high salinity of up to 42%0, while water temperatures can fluctuate from 18�C in winter to as much as 25�C in the summer (Price & Roberts, 1992). A phosphate factory, located a few kilometers north of the RDC, might be a possible source of pollution in that the supplying trucks with an improperly covered cargo can lead to airborne relocation of phosphate fertilizer. The main search effort to find diseased corals was devoted to the waters in front of the RDC, and to a lesser extent to the sites "Gorgonia-I" and the "Saudi Border Drop Off", both part of our excursion program (Map CD-1). The reef flat stretches across about 5 m at one location and to as much as 15 m at several other locations before abruptly terminating at the reef crest. Reef access was achieved using the RDC�s jetty, which reaches beyond the reef flat and separates the entire reef stretch into two sections (Fig. 2). The left hand or southern side of the jetty, shortly before the reef crest, has an average depth of about 4 to 5 m and borders a sandy substrate, which bears an extensive sea grass bed. The northern or right hand side of the jetty, displays a steep and stony slope (mostly secondary hard substrate). 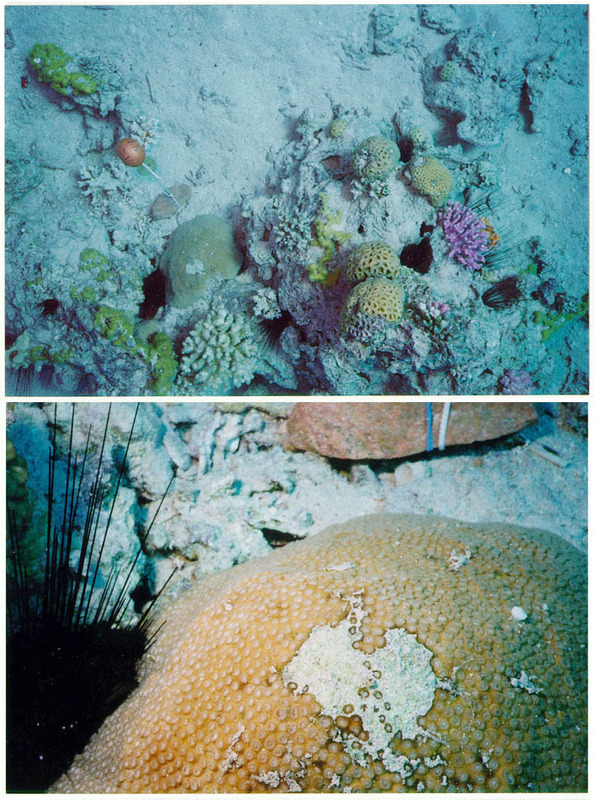 Although coral growth persists beyond the reef crest, the lower sections of the slope are dominated by sandy substrates, limiting corals to isolated patches. In general, corals are abundant along the entire reef stretch, from just below the water line down to roughly 50 m. Only the upper 30 m were monitored. In order to assess the general health of the corals, two monitoring approaches were conducted. The use of transects yielded a quick picture about the quantitative extent of damage, while selective analysis of diseased sites provided further information about the qualitative aspects, i.e. the types of symptoms affecting a particular coral colony. 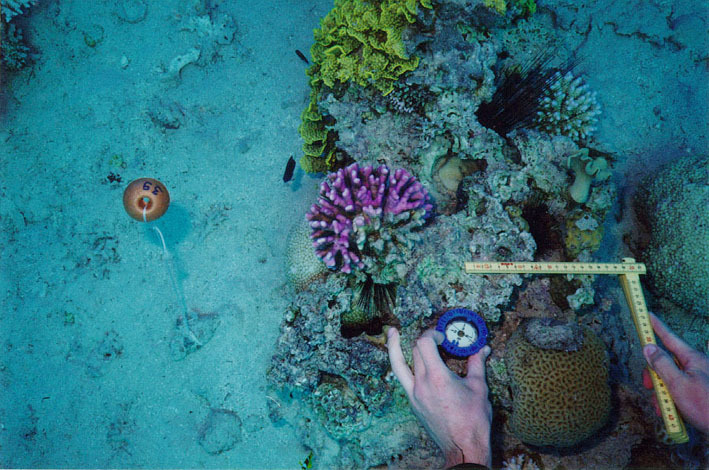 Only hard, reef-building (hermatypic) corals that exceeded 10 cm in diameter were selected. The corals were identified to the lowest possible taxonomic level. Material: The main instrumentation used throughout the survey involved the following items: A plastic slide-caliper, 2 measuring tapes (2 m and 30 m long, respectively), water-resistant digital thermometers, an underwater compass, polyurethane marking buoys tied to stones, plastic stakes, underwater writing slates, a 15 m long rope, aluminum nails and several underwater cameras. Quantitative method: The four randomly selected transects covered an average area of 60 m2 (a 30 m long section defining a 2 m wide strip - 1 m at each side). Coral coverage, as well as the number of diseased colonies along with the degree of damage, were registered. In order to avoid the sea grass beds, all four transects have been set along the northern side of the RDC, perpendicular to the shoreline down the reef slope (Map CD-2). The type of damage recorded was limited to five classes: healthy, mechanically damaged, disease related damages, bleached, and blotched (spotted). The extent of damage was split into four categories (≤25%, 26-50%, 51-75%, >75%). An initial separation into branching and massive corals revealed further details, since branched colonies differ slightly in their symptoms compared with massive ones. In the quantitative census, the living coral coverage along each transect was estimated at meter intervals. 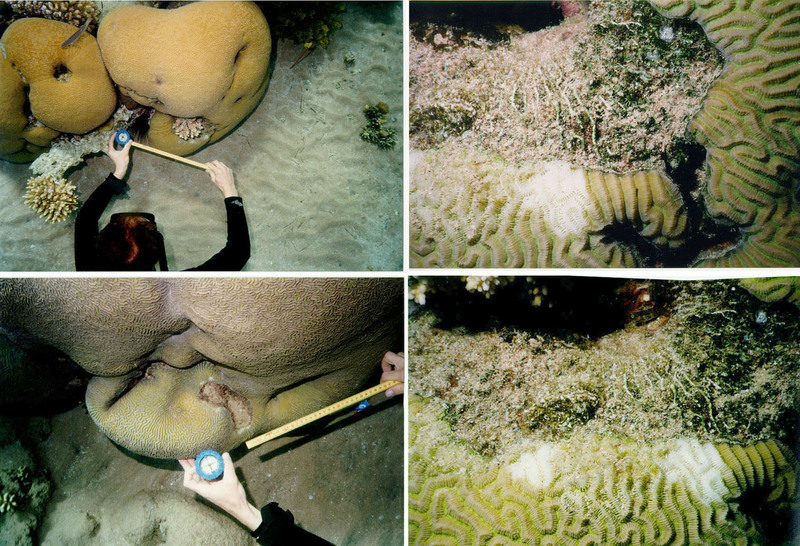 Qualitative method: Beyond the overall extent of damage, several diseased sites were further analyzed to determine the type of causes affecting a particular coral colony. 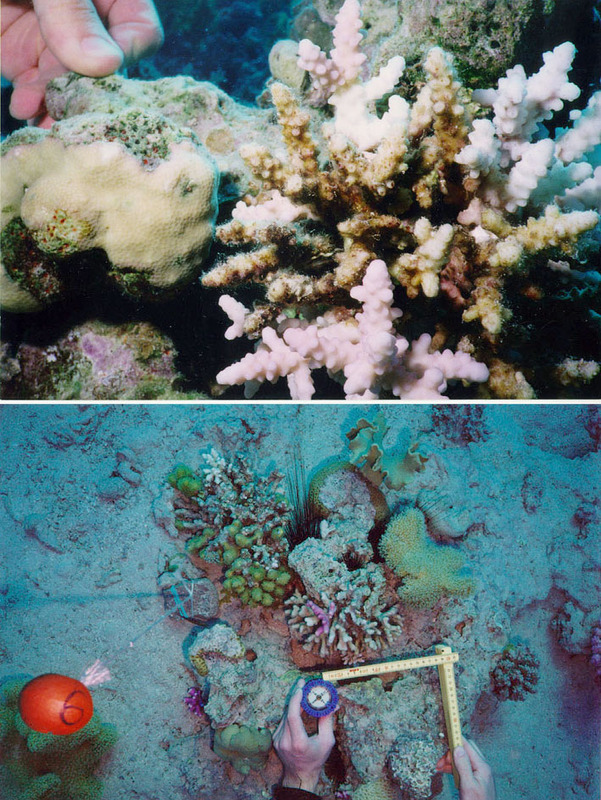 Several diseased corals were further monitored by registering water temperature, depth, length and width (NS/EW extensions according to the compass) and height. Finally, underwater photography not only provided good documentation of the type of diseases, but also was a powerful tool in verifying the identification (at least on a genus level) of a particular colony. The quantitative survey was limited to the northern section of the jetty, while the qualitative survey was spread along the entire stretch of the RDCs shoreline (Map CD-2). The qualitative assessment involved many diseased coral sites, of which a total of 12 were chosen for long-term observation. Alphanumerically coded buoys were used to mark a coral colony suffering from one or more symptoms (code in parentheses). These were replaced at the end of the two-week survey by 2 mm thick, more resistant plastic stakes driven into the sandy substrate. For long-term marking, each of these stakes bears a duct tape label with the new number code written on it (Map CD-2). Some of the smaller sites were labeled twice to ensure that that one of the stakes will be found in future courses. Five spots (sites R; M; A/8; 35; and L) are located in close proximity to the reef crest just below the water surface. These were easily accessible by snorkeling. Sites R and L are large brain corals of about 1 m in diameter, which should be easily found using the map in Map D-2. Therefore, these two sites were not further labeled. R almost reached the water surface, therefore was subject to periodic drying, while colony L was never exposed to air. 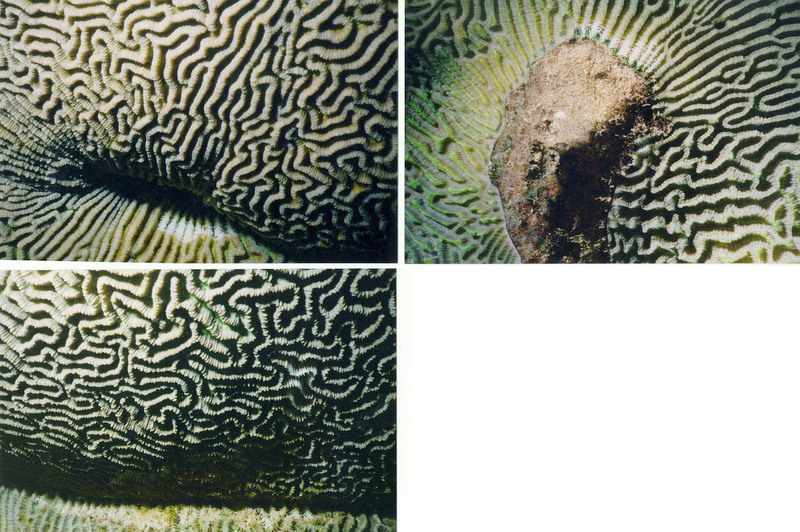 The brain coral labeled as A/8 was given two stakes. The remaining sites are located along the reef slope at a depth range of 10 to 28 m. These locations require the use of SCUBA gear. A further attempt to evaluate the general state of health of the reef was done at two separate patch reefs on the far left of the RDC reef stretch (35). These sites were located at a depth of about 4 m and could therefore be easily accessed by snorkeling as well. 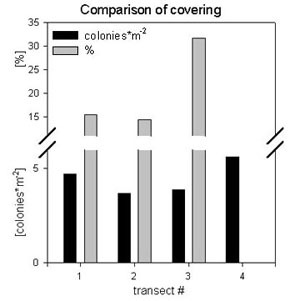 Coral coverage on the transects were 15.5% in transect T1, 16.5% in transect T2 and 31.7% in transect T3 (Fig. 3). Coral coverage of T4 has not been estimated. Having included both soft and hard corals in the estimations of coverage, only hard corals have been monitored in the disease-census. According to Fig. 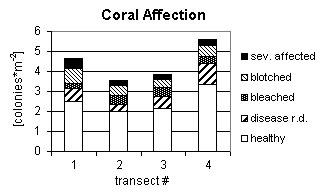 4, transect T3 displayed a higher coral coverage than the other three transects. Regarding the applied methods, T3 most probably reflects a higher constituent of soft corals compared to the other remaining transects. In order to obtain comparable data, the results were also expressed in colonies per square meters, based on results from the disease-survey. As a result, neither of the four transects deviated considerably. In general, hard coral coverage was not regularly distributed but grouped in clusters. Among them, there were also soft corals, sponges and many sessile as well as mobile benthic organisms. Within each transect, the extent of healthy and damaged corals was evenly distributed. Some common symptoms observed were white patches, black bands across corals, algae overgrowth on or around bleached sites, denuded skeletons, broken or detached corals, mucus secretion by vermetid snails, etc. These manifestations were found on several hermatypic species (order Hexacorallia) of this contour reef, among them, the representatives of the families: Acroporidae, Pocilloporidae, Poritidae, Faviidae and the solitary living Fungiidae. According to Fig. 4, the extent of corals affected by some type of damage in all of the four transects averaged about 44%, while the percentage of healthy coral seemed to fluctuate around 56% (± 2.7). The heaviest impact among affected corals was found in the categories disease related damages 14,2% (± 3,5), and blotched 12,6% (± 3,2) corals. Such high levels of damage suggest that the reef stretch surveyed does show significant signs of stress. Note that both the "blotched" and the "diseased" categories do not reflect particular symptoms per se, but can be the result of several influences that we were unable to determine. One conclusion can be drawn: coral bleaching does not seem to be a major cause of coral destruction within the examined reef section - indicating that temperature fluctuations below and above the ideal limits are neglectable. The remaining 6,2% (± 0,5) of affected corals showed some sort of mechanical damage primarily due to snorkeling, improperly balanced divers, and natural predation by parrotfish. 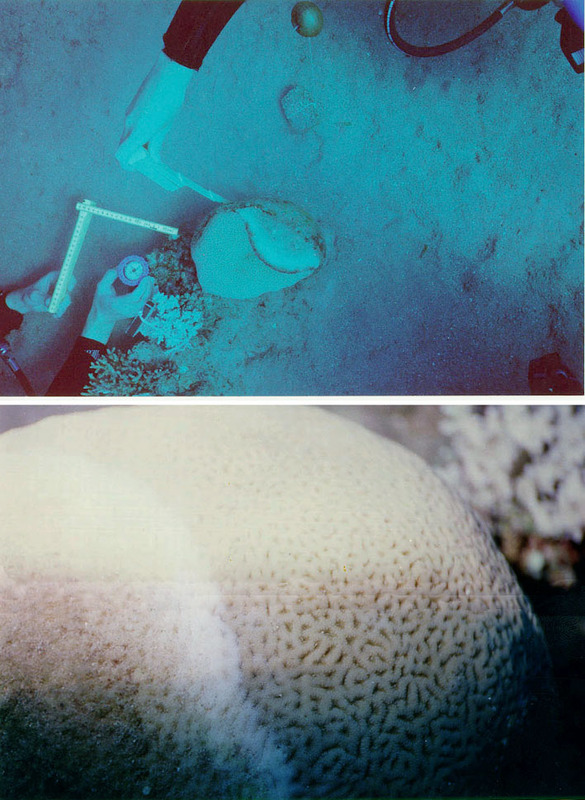 Examining the massive and branching hard corals separately reflects a similar picture. Among massive corals, about 59,2% of the colonies were damaged, while the value in branching corals was 40,8% (Fig 5). Blotched symptoms were found to be more common among massive corals (87%) than on branching corals (13%). Although we could not definitively attribute blotching to a distinct disease, we assumed that it does represent an impairment to the overall health of the coral colony (Fig 5). Among the branching corals the dominating symptom found was to be damaged (17.6%). Fig. 5: Proportions of affection of different morphotypes. 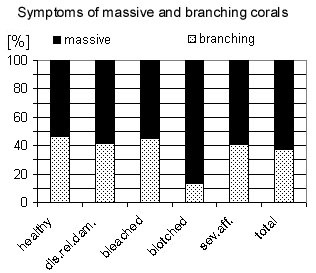 In general, the overall symptoms among branching corals outnumbered the symptoms on massive corals. It is possible that the morphological differences between these two types of corals influence the resistance against diseases. In Fig. 6, the same results are expressed as colonies per m2. Similar trends as in the proportional presentation can be observed. Another qualitative analysis was done on two different patch reefs - a larger and a smaller coral block (refer to Map CD-2 for its location). The larger patch reef (Fig. 7, site 35) measured about 3.5m in height and almost touched the surface. Being exposed to extensive wave action, coral coverage on top was not evenly distributed amounting to about 25%. Whereas, coverage of corals of the edges was about 75%. Sporadic algae were detected at several locations, but they seemed not to be correlated with the symptoms described below (sets of Fig�s. 8 and 9). The first two charts (Figure 8a and 8b) show the general state of health of the patch, while Figure 8c displays the degree of symptoms in percent of corals showing certain abnormalities. As this survey has been done solely by snorkelling, a differentiation between mechanical and biogenic damages could not be done due to methodological reasons. 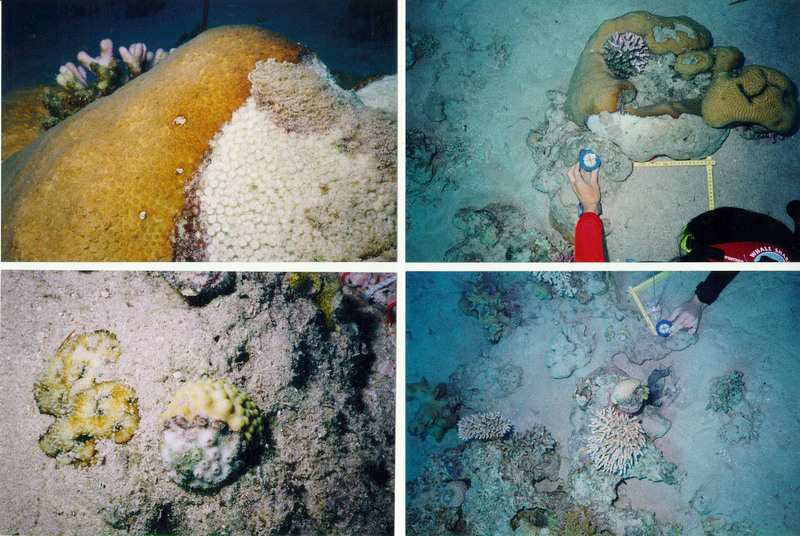 About 70% of all the corals observed showed no visible damage (Fig. 8b). Among the other 30%, which displayed some sort of damage, bleached corals were predominant, followed by mechanical damages and blotched symptoms. In general, the branching corals seemed healthier than massive corals (Fig. 8b). This distribution, which differed strongly from the ones found in the other surveys. It is most probably the result of improper behavior of the bathing public. The observed coral damages from Fig. 8b were further categorized into four groups, while symptoms were displayed separately in Fig. 8c. The most affected colonies were found to be already in an advanced stage, with the extent of damage peaking within the 26-50% range. Whereas, dead corals, which were treated in the damaged category ">75%", were rarely recorded. 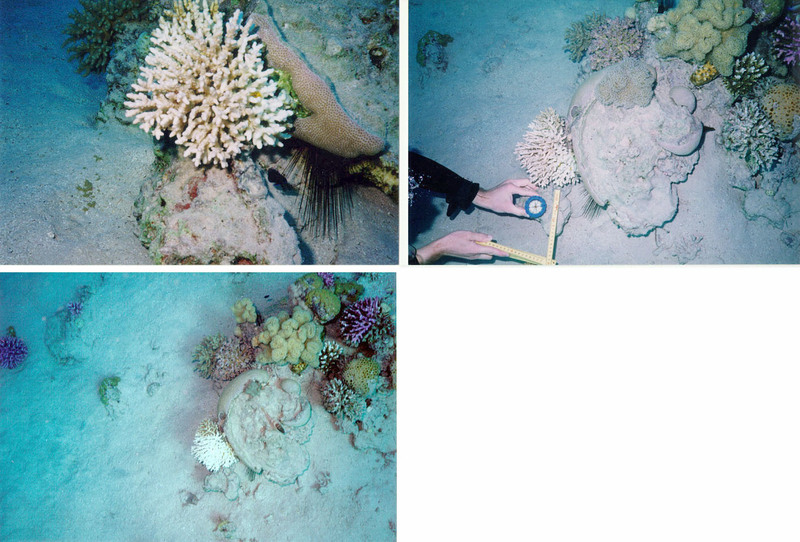 The smaller patch reef, in close proximity to the larger one described above, measured about 2 m in height and was located at more or less the same depth as the larger patch, thus it had a reduced risk of being exposed to the air. This fact is also reflected in the homogeneous coral coverage (almost 100%) of the entire block, with no algae present at any site. Fig. 9a and 9b show the general state of health of the smaller patch. Fig. 9c shows the degree of symptoms showing certain abnormalities (in percent). As in the larger patch reef, healthy corals outnumbered the affected coral colonies at a ratio of about 3:1. About 75% of all the corals observed showed no visible damage (Fig. 9b). Among the remaining 25%, damaged corals dominated over the bleached and blotched symptoms. Again, the branching corals seemed healthier than the massive corals (Fig. 9b). Categorization of damaged corals (Fig. 9c) revealed that the extent of affected corals was less than 25%. Qualitative analysis of diseased coral colonies in the waters in front of the RDC were restricted to 10 distinct sites, which revealed a broad variety of symptoms (for overviews, see Fig.s 2 and Tables 1 & 2). Coral bleaching, band diseases and blotching, amongst other symptoms, were common. Mechanical damages on corals could be further separated into natural causes (predation by parrotfish, echinoderms, epifauna or endofauna) and anthropogenic impacts mainly caused by snorkelers standing on the corals, or by improperly balanced divers, etc. As expected, branching corals by nature were more affected by mechanical breakage due to clumsy swimmers and massive wave action than massive corals. Severely affected colonies were quickly overgrown by a thick layer of algae or, in many cases, covered by sand. Thus, sedimentation did pose a problem. Our observations revealed that the southern side of the RDC is more exposed to the persistent currents and winds from the North to NW. These findings may provide one explanation why the reef flat north of the jetty is in a better state than the section south of it. It is likely that there is a gradual retreat of the sea grass beds, exposing the reef crest, as well as the reef flat, to suspended particles, mostly sand, that might influence reef health; but such a hypothesis requires further investigation. Another aspect that influences coral colonies is floating plastic bags; they pose a problem once they become entangled, predominately among branching corals. At the time of our investigation, October 1999, water temperatures remained around 25 �C. Year round observation would be needed to reveal whether temperature fluctuations or peak temperatures affecting coral growth - especially during the hottest months of the year. Very interesting findings were associated with sites F2 (2.c), Fig.10 and P10 (2.h), Fig 11. The former (Plesiastrea sp.) had a large bleached section covering almost 1/3 of the entire coral block, while the latter (Coscinaraea sp.) showed similar symptoms roughly of the same extent. Due to the short observation period, attempts to monitor the migration of the band across the coral colony using aluminum nails that were driven into the denuded section of the coral, failed to provide substantial results. Fig. 10: Diseased Plesiastrea sp. Fig. 11: Diseased Coscinaraea sp. The northern section of the Red Sea of the Gulf of Aqaba receives slightly less solar radiation than other coral reefs around the globe. An average of 1.68 J× cm-2×min-1 penetrates the surface waters of the Gulf (Rauschke et al., 1973). One might conclude, that the amount of photosynthetic active radiation (PhAR) reaching the zooxanthellae in the corals could result in slower growth compared to other reef locations worldwide. It is likely though, that adaptation of these organisms have led to an increase in photosynthetic activities, similar to extreme temperature fluctuations of the surface waters within the Gulf. At this point, however, it cannot be determined whether slight deviations from normal abiotic patterns are responsible for higher levels of coral diseases in this area. Furthermore, the increase in atmospheric CO2 due to increasing greenhouse gases results in an elevated partial pressure, thus increasing it�s solubility in the oceans. Again, one might deduce that elevated pCO2 fertilizes the zooxanthellae, thus increasing productivity. Obviously, these topics go beyond the framework of the present study. Corals, like any other sessile organism (sponges, bivalves, etc. ), require hard substrate. It seemed that the left-hand side of the RDC (south of the jetty) is more exposed to the persistent currents and winds from the north to NW than the right-hand side (north of the jetty). These observations may provide one explanation why the right reef flat is in a better state than the left reef flat. Sedimentation not only suffocates existing colonies, but also may alter the substrate, making it inhospitable for the settlement of coral larvae. 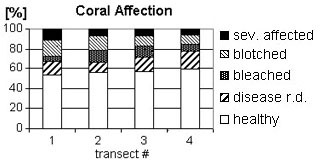 Intraspecific aggregation decreases the rate at which space is partitioned between coral species. It also decreases rates of resource intake per individual polyp and thus decreasing colony growth and development (Begon et al., 1996). The partitioning is species dependant and also is determined by initial conditions. In a thriving reef community, space can be seen as a resource limited in supply. Furthermore, severe inter- and intraspecific competition also results in fewer offspring and reduces fecundity (Begon et al., 1996). The fittest colony of each species may then be those that "escape" competition because they utilize the habitat in ways that differ most from those adopted by colonies of the other species. Such a fundamental niche is usually narrowed down to the realized niche as competition increases. Based on our present observations, niche partitioning is less important, because data of coral coverage do not support such claims. According to our observations, transect analyses revealed that coral distribution seemed to follow a clustered rather than a random or even pattern. This would imply that such crowded aggregations not only facilitate the spread of diseases, but in occasions, reflect a considerable impact of both inter- and intraspecific competition among coral colonies. Having examined several sections of the RDC�s reef stretch, it can be excluded that space is of limited supply. Thus, neither competition, nor facilitated spread of diseases due to cramped conditions can be held responsible for the elevated number of diseased coral colonies. In addition, each modular organism may broadly be divided into those that concentrate on vertical growth (branching corals), and those that spread their modules more or less laterally (encrusting or massive corals). The present study focused on both branching and massive corals. In general, coral death often results from becoming too big or succumbing to disease rather than from programed death. On the other hand, observations on the Great Barrier Reef (GBR) support the opposite conclusion. Annual coral mortality at the GBR declined sharply with increasing colony size - and hence, broadly age - until, amongst the largest, oldest colonies, mortality was virtually zero; there was no evidence of any increase in mortality at extreme old age (Hughes & Connell, 1987). This observation led to a concave survivorship curve, in which survivorship of the larval stage and settlement sharply declined and then decreased moderately with age, allowing only a few colonies to reach old age. Even though branching corals due to their fragile nature differed somewhat in their survivorship curves compared to massive corals in that old age is not always reached, the allover trend is probably the same. This principle is further backed up by the fact that almost all corals produce millions of eggs and sperm of which very few survive to become adults (Pearl, 1928; Deevey, 1947). In our study area, however, it is very unlikely that the average colony size is responsible for increased coral mortality, since most of the corals appeared to be relatively small, in that they can be considered to be already beyond the massive juvenile die-off interval. Microbial infestation seem to play a role in the general state of health among hard corals. The fact that water pollution might boost the number of bacteria, viruses and funghi is further emphasized by the findings of definite pathogens, as recorded in the two BBD affected coral colonies (Fig�s. 10 and 11). Such findings have been also documented by investigations made in recent years along the shores of the Red Sea (Antonius, 1987, 1995). In general, all of the theoretical facts mentioned so far probably influenced the upper and lower reef slope to a lesser extent, than the corals of the reef flat and the reef front. A yet another interesting observation was made at the reef crest and the two patch reefs. Corals there seem to be in a better state of health than their reef flat counterparts and the corals of the reef slope. At this point it should be mentioned that the survey of the reef crest, patch reef and those along the reef slope have been made by different groups. Even though differences in perception could have influenced the survey, it is very unlikely that the observed facts could have resulted in major differences. Transect analysis along the slope revealed a more or less constant ratio of healthy and diseased coral colonies. About 56% of the hard corals showed no visible symptoms; those that did were mostly affected by algae overgrowth of already dead segments or affected by blotches. Both of these symptoms, however, did not represent distinct diseases, although they could be the result of such influences. One has to keep in mind that even in healthy reefs, about 5% of the coral population are dying of age-related diseases (Antonius, 1984). It is therefore obvious that the transected areas suffer somehow from severe symptoms of stress. 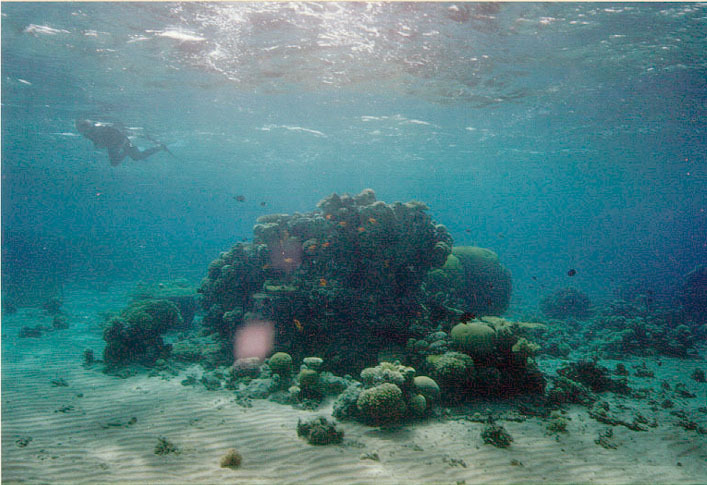 Repeatedly, affected areas of corals where covered with a more or less dense layer of algal overgrowth. Some massive corals of the genus Favia, Favites, Coscinaraea, Astreopora, as well as some cabbage corals like Turbinaria, Echinopora, Oxypora. and Platygyra sp. have accumulated such dense layers, that waving gently with ones hand usually ripped off the mucus and algae exposing the naked skeleton. It is probable, as suggested by Antonius (1995), that the combination of sticky mucus and algae suffocates the polyps underneath. Mucus production on massive corals, not originating from the corals themselves, is often caused by the solitary, encrusting, to be dwelling vermetid gastropods. Many symptoms observed have been summarized in the "damaged" category. This simply reflects the scarce knowledge about coral diseases and the typical appearance on different species. Furthermore, it is possible that some symptoms due to biotic influences probably do not reflect a specific disease, but could be morphological variabilities. A general trend within the transected areas indicated that diseased corals are more frequently found among massive corals rather than on branching ones. Mechanical damages on massive corals within the shallow water region predominantly resulted from recreational activities of the general public. Predation along the reef slope has been observed to take place only occasionally and is mainly related to parrotfish bites nibbling on the coral, while not one case of anchor damage was recorded in the surveyed area � gratefully the result of the strict rules imposed by the operators of the RDC. 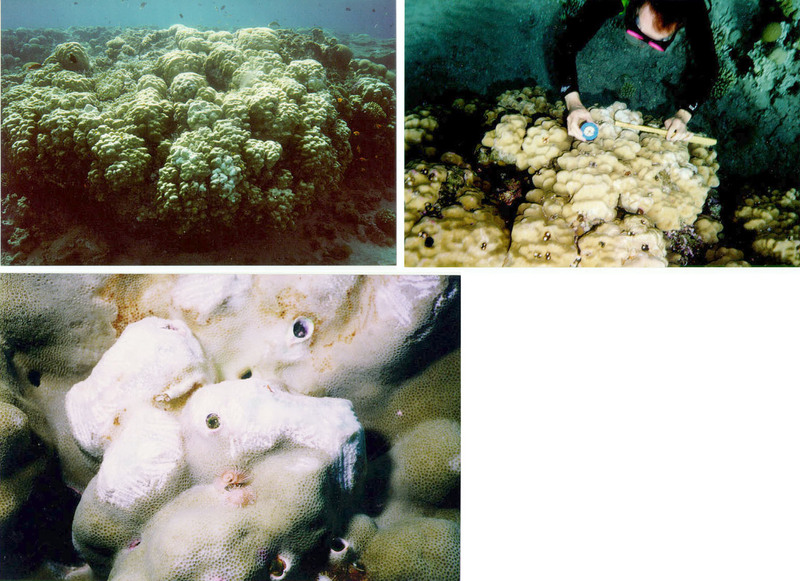 In many cases, bleaching seemed to be another source of poor coral health. Floating plastic bags did pose a problem along the sites of study, since they become entangled among the corals, depriving both branching and massive corals of vital sunlight or simply ripping off segments of branching corals due to increased drag against wave action. It is most likely that morphology, i.e. fast-growing branching corals, plays a role in lowered resistance against mechanical as well as immunological factors (Wells, et al., 1992). Branching corals such as Stylophora sp., Pocillopora sp. and Acropora sp. are subject to frequent algae overgrowth because such rapidly growing species may be initial colonizers, perishing as fast as they appeared. Accordingly, more colonies of these species would be covered by algae because more dead colonies exist naturally. We assume that the contour reef along the RDC does show signs of stress. Regular monitoring should provide more clues as to whether this is a temporary event or an ongoing trend. Further investigation should also focus on the sources and on the triggering mechanisms that cause such massive impairments. This information could eventually be used to improve the general state of health among corals in this area. Therefore, this survey should be seen as the first one in a series of many still to come. Hughes T.P., Connell J.H., 1987: Population dynamics based on size or age? Wells S., Hanna N.; 1992: The Greenpeace book of Coral Reefs - Sterling Publishing Co.